Corsair has long been a believer in wireless headsets. The Vengeance and Void families both had/have wireless SKUs within them, and now it's the turn of the explicitly value-focussed HS Series. Supporting both PC and PS4, the HS70 is a wireless stereo gaming headset with virtual 7.1 surround sound supported for PC users. The HS70 has no onboard aesthetic lighting, and Corsair has instead opted for colour-neutral designs with one all-black SKU and one black and white model which we have. As such, it won’t add to your RGB-laden battlestation, but it won’t detract from or clash with it either. It looks very similar to the HS50 Stereo and thus also very much like the renowned HyperX Cloud and Cloud II headsets, but the HS70 is a Corsair in-house design and not licensed like the Cloud models. The construction is advertised as a pleasant mix between sturdy and lightweight, and this appears to hold up. The 330g HS70 initially feels worryingly light, but a closer examination reveals a hidden strength, stemming mainly from the use of a metal headband and aluminium yokes. The ABS plastic, where used, has a mild soft-touch coating, and there’s no loose cabling either, as it runs subtly along the inside of the yokes. The accent stitching on the headband is a welcome touch, too. Supplied with the headset is a detachable microphone, a 2.4GHz wireless USB dongle, and a rubberised micro-USB cable for charging via the ear cup’s connector. My feelings regarding comfort are, unsurprisingly, the same as with the HS50 Stereo. The ear cups aren’t that deep or flexible, but they do fully encircle my ears. The memory foam that’s used generously here and on the headband is a bit harder than on some squishier models, but it’s comfortable nonetheless with its leatherette covering. I didn’t really need to extend the headband at all, which is unusual for me, but there is added height if you need it. The clamping force under the ears is a tad higher than ideal, but weight distribution on the whole is good. It doesn’t compete with the Cloud headsets on this frontier, though it isn’t far off the mark, and I was fine wearing the HS70 for extended periods. That said, in the recent sweaty weather, the non-breathable ear cup covering does lead to some noticeable ear warming, but the same is true for all headsets with this design. You can get an idea of how the HS70 Wireless sits on your head further down the page thanks to our Deadpool model - thanks to Numskull for supplying him! With the headset on, you’ll find controls on the underside of the left ear cup – an intuitive wheel to adjust volume and a well sized button for muting the microphone. The wheel controls the volume of the headset directly rather than the hooking into the Windows volume controls. The mic mute button, though, triggers audio feedback – generic beeps by default and spoken word once the software is installed. On the opposite ear is the power button only. Setting up was as simple as plugging in the dongle and turning on the headset; the connection was made almost immediately. I don’t have a PS4 to test with, but I assume the experience there is similar. The range is advertised as up to 40 feet (just over 12 metres); I was able to wander around a medium-sized open plan office without trouble, but entering rooms with thick walls or changing floors would interfere with the signal. That’s to be expected, though, and I’m satisfied with the range of the HS70. Battery life, meanwhile, is said to be up to 16 hours – no problems there. Inside the ear cups you’ll find the same 50mm Neodymium drivers as those in the HS50 Stereo. Unsurprisingly, the audio experience is just as solid: Music is enjoyable and nicely balanced across the audible spectrum, while games benefit from the satisfying but not overpowering bass and dialogue comes through clearly. The HS70’s highs don’t reach the crispness achieved by the HyperX Cloud or Cloud II, but few headsets have highs that do. I also noted that there’s no annoying audible noise from the wireless receiver, which is a bonus. All told, the HS70 Wireless doesn’t disappoint in any area where sound quality is concerned, but neither does it blow your socks off with clarity. The fully detachable microphone is unidirectional and noise-cancelling but comes without a pop cover. Actual sound quality is very good, and a clear improvement on the analogue HS50 Stereo. There’s less hissing in recordings, and voice clarity is improved. Background noise is also dealt with admirably. The HS70 has also achieved Discord certification; the process for this is outlined here, and you can find a full list of such headsets on the app’s official website. 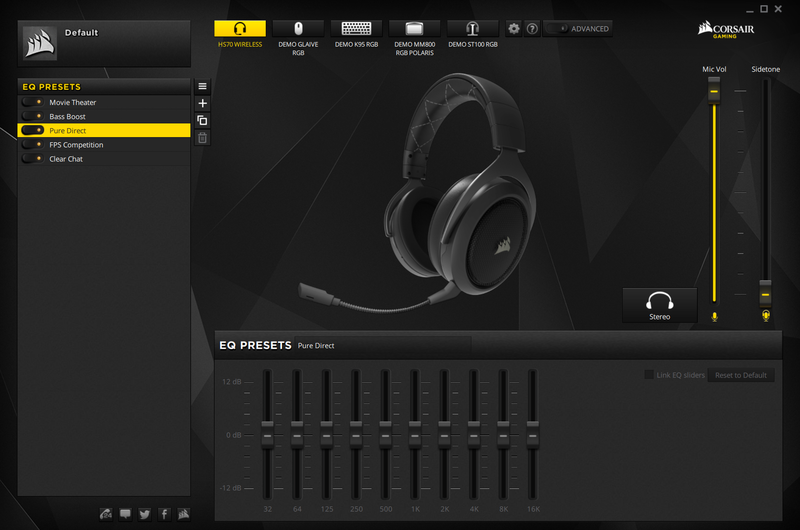 Corsair Utility Engine (CUE) supports the HS70 Wireless, offering users a few adjustments: main volume, sidetone monitoring volume, EQ control, and a toggle for virtual 7.1 surround sound. The latter is the same as ever, adding a sense of depth to properly mixed content but messing with stereo content and not really giving you proper locational awareness. Still, it’s there and easy to try out – the software has a single screen to manage everything. At £99, the HS70 is one of the least expensive wireless gaming headsets out there. With an easy setup, decent range, and promising battery life, it ticks the boxes it needs to when cutting the cord. Sporting solid sound in the headphones and very good microphone quality as well, it will be a worthwhile gaming companion. In short: If we had £100 to spend on a wireless headset, this would be our pick. The wallet-friendly, £55 HS50 Stereo is light on features but strong when it comes to comfort and sound quality - well worth a look.